The addListener() uses the private _listeners object to store event handlers for various events. When an event handler is added, the method first checks to see if there's a named property for that event type on the _listeners object, and if not, creates one containing an array. The event handler function is then saved to the array for later. The fire() method fires an event with a given name. In effect, this method's only job is to execute each event handler for the given event type. The method accepts either an object, in which case it's expected to have a type property, or a string, in which case a new object is created and the string is assigned as the value of type. Next, if the event object doesn't have a target property assigned, it is set to the current instance. This effectively creates an event object similar to the one most are familiar with via the BOM and DOM. 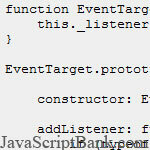 Once the event object is created, the _listeners object is checked for event handlers, and if found, they are executed. Note that in order to mimic the BOM/DOM approach, event handlers are executed in the scope of this via the call() method. The last method, removeListener(), simply reverses the process of addListener(). It searches through the _listeners property for the given event type to locate the specified event handler. If found, the event handler is removed by using the array's splice() method, and otherwise it exits without doing anything.